This dictionary is a revised and expanded version of a dictionary that was published in 1976, but which is now out-of-print, and out-of-date. It was published as: Lawrence A. Reid, Bontok-English Dictionary, with English Bontok Finder List. Pacific Linguistics, Series C, No. 36, pp. 505, Canberra: Australian National University. The introductory paragraphs which follow are taken from the old dictionary and provide a little background about the language. To go directly to an introduction to the Talking Dictionary on this site, click here. Bontok is the name given by linguists and anthropologists to that variety of speech which is the most commonly used language in the communities of the Bontoc municipality in Mountain Province, Philippines. This speech variety extends beyond the Bontoc municipality northeast to include communities in the Sadanga municipality, and southeast to the Barlig municipality. It merges to the east into the Eastern Bontok, or Natunin language, to the south into Ifugao, to the west into Northern Kankanay and to the north into Kalinga. Each of the Bontok speaking communities is characterized by its own dialect of the language, having distinctive intonation, pronunciation and lexical items. The dialects are, however, mutually intelligible, with the degree of intelligibility greatest between communities that are geographically close, and less between more distant communities. This dictionary represents that dialect of Bontok spoken in Guinaang, a barrio of approximately 350 households situated north of Bontoc town by about 15 kilometers. This particular dialect is called by the villagers gininaang or simply kali the language. This dictionary grew out of a wordlist gathered by the author during his first visit to Guinaang in August, 1959. Subsequently, through extended periods of residence in Guinaang until 1970, and in brief annual visits thereafter, that wordlist was expanded until it reached its present form. Dictionary making is a task which is never completed. This version, the first to see print, is merely an initial step in the task of making known the richness of vocabulary of a proud and honorable people. Large areas of vocabulary are as yet unexplored, and the clarity and accuracy of the definitions given here leave much to be desired. It is hoped, however, that for Bontok people seeking to enrich their understanding of English, and for linguists, anthropologists, missionaries and others who wish to gain a fuller understanding of the language and culture of Bontok, this volume will be a useful tool. Over the last half century, a wide variety of factors has impacted the indigenous cultures of the Philippines, resulting in a process of cultural homogenization, so that today much of the once distinctive character of these communities has been modified and is in serious danger of being lost. Probably nowhere in the Philippines is this headlong rush to modernization and homogeneity more apparent than in the once conservative areas of the mountain provinces of the Northern Philippines. On the surface, the changes can be easily seen in the shift of housing styles from the traditional thatched roof to the modern wood frame lowland style with rusting galvanized iron sides and roof. Similarly, loss of traditional artifacts, such as basketry, tools, traditional weapons, and clothing styles can also be readily noted. Less obvious, but just as real, are the losses of traditional cultural practices associated with rice cultivation and the various complex wedding rituals. But the most insidious of the losses are those that are less obvious, but underlie each of the losses just mentioned. Specifically these are the linguistic changes that result when traditional artifacts are no longer used and old cultural practices are discontinued. The indigenous terminology associated with these artifacts and practices is no longer used and children grow up without the knowledge of the rich heritage which is theirs. Paralleling the obvious cultural changes then are various linguistic changes. Some are directly associated with the loss of cultural artifacts and practices, others are the result of the ever-increasing effect of the prestige dialects of the municipal centers, regional languages, such as Ilokano, the national language, Tagalog, and at least one international language, English. The rich, indigenous, linguistic diversity of the past, by which it was possible to unambiguously determine the home village of any mountain person by his distinctive pronunciation and lexicon is giving way to a variety of language use among young people that is impoverished in terms of traditional terminology, and reflects the patterns and vocabulary of one or more of the prestige dialects and languages of the area. The above paragraphs characterize the situation as it exists in probably most areas of the mountain provinces of Northern Luzon today. In the following section, I will focus discussion on one municipality, that of Bontoc, Mountain Province, where the Bontok language is spoken. 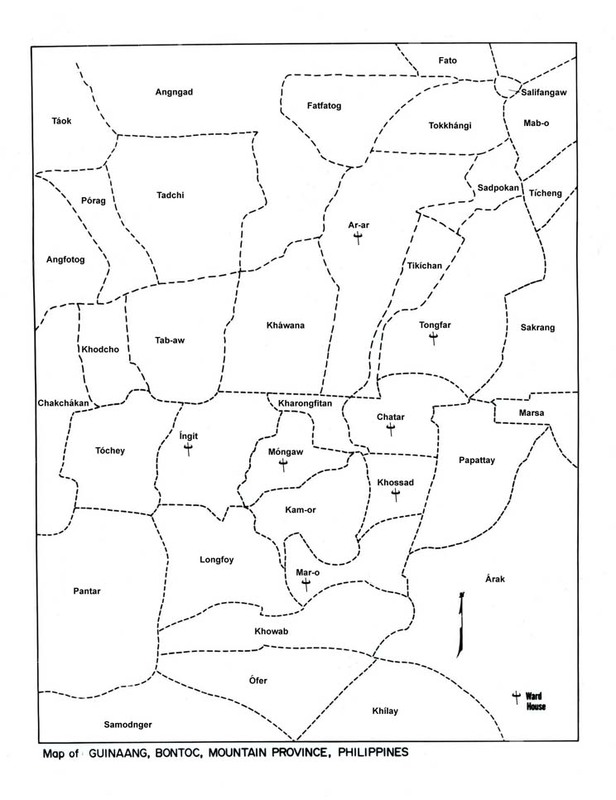 There are sixteen barangays (politically recognized communites) that constitute the municipality of Bontoc. Prominent among these are the traditional community centers of the town itself (Bontoc íli), along with the villages of Samoki (directly across the river from Bontoc town), Tocucan (the first village on the road going north from Bontoc town up the Chico River valley towards Kalinga Province), and the mountain villages of Malegcong, Mainit, Guinaang, and Dalican, having a combined population of at least 40,000 people. The changes that have taken place in the community called Guinaang over the last approximately 40 years are typical of those that characterize each of the villages mentioned above. In 1959, when I began my study of Bontoc language and culture, Guinaang was a village of around 300 households, all but two of which were traditional thatched-roofed houses. [image] There was no access by road to the village. There was no electricity, or running water. There were no radios in the village, nor were there any sari-sari (convenience) stores. There was a public elementary school with four grades and two teachers. Only one girl had started school, but had dropped out because of family pressure. Traditional rituals were widely adhered to, and the language spoken, a distinctive dialect of the Bontok language, was fairly uniform throughout the community. Today, the village has expanded to almost twice its size in 1959. [picture] There are only five remaining traditional houses in which people live. None is well-maintained. A road to the village has been built, the first jeep reaching Guinaang in 1982. Today three jeeps make round trips from Guinaang to Bontoc each day. Piped running water was brought to the village in 1985. The village was electrified in 1992. Today there are at least 10 convenience stores in the village, and a large majority of homes have small radios. One family has brought in a video machine and shows videos commercially. Three rice mills now operate in the village, the first one being introduced in 1985. Cooking practices have changed, with traditional open fires in the houses and charcoal stoves giving way to gas stoves. Most of the traditional baskets types, weapons, and tools have disappeared, many having been "antiqued", a new term in the language, referring to cultural artifacts that have been sold to antique dealers from Baguio and Manila. The retreating forest and consequent difficulty of acquiring bamboo and rattan for weaving has resulted in a switch from traditional basket use to the use of plastic and metal containers. Only a few of the older men still remember how to weave. The traditional dormitories for young women have all disappeared, and the traditional obbo working system, which depended on the contracted labor of groups of young women with men from specific mens ward houses (L. A. Reid, "Wards and Working Groups in Guinaang, Bontoc, Luzon," Anthropos 67:530-563.1972) has also disappeared. Only the oldest of the men and women still use traditional clothing. The little elementary school is now a full elementary and high school, with 19 teachers. There have been at least 30 college graduates from the village, a number of whom have worked abroad in places as far afield as Florida, New York, Taiwan, Hong Kong, Saudi Arabia and Singapore. At least ten overseas workers have returned to the village, supplementing the many retirees from the closed BCI gold mines in Sang-ilo, Antamok, Acopan and Baguio Gold, and others from the mines in Felix and Lepanto who have returned with their families (and acquired wealth) to live in the village. The major factors then that are resulting in cultural and linguistic change in Guinaang are those that are at work in each of the Bontok speaking communities, viz., the movement of young people to areas outside the community for education in places such as Baguio City and Manila, for work opportunities in mines, market gardens, and overseas. Many of these young people meet and marry partners who do not speak their home dialect, and then return to the village. Such close interaction with people from communities other than ones own requires the use of Ilokano (or some other regional language) in order to communicate. Children in these situations grow up hearing only the regional language. When their parents return to the village with the status that education and money bring, children do not acquire the less prestigious local language, or they do so only imperfectly. Furthermore, teachers in the local schools are often from communities other than the local community, and do not speak the local dialect. (In Guinaang, only two of eleven elementary school teachers grew up in the Guinaang). As school teachers, their dialect is more prestigious than the local dialect. Pre-school children in homes in which the mother is educated are often spoken to in a mixture of English, Ilokano, Central Bontok, and or Kankanay, depending on where the mother received her education. It was to address these factors, that, is the loss of cultural and linguistic knowledge of today's young people, not only in Guinaang, but also in the other Bontoc communities, that precipitated the development of this dictionary. It is hoped that it will serve as a repository of the way Guinaang Bontok used to be spoken when the old culture was still vibrant. Nearly every word in the dictionary is associated with a sound file, so that one can hear how the form was pronounced, this is why it is called a 'Talking Dictionary', and many of the cultural items for which I have been able to take pictures are accompanied by image files. This acknowledgement page consists of two parts. The first recognizes both the institutions, organizations, and people without whose help my original Bontok dictionary could not have been published. The second recognizes those who have made possible this new version. The first set of acknowledgements below are taken from the old Bontok Dictionary. I repeat them again here. Although many of my old friends who helped with that dictionary are no longer living (their names are preceded by an asterisk in the list below), a number still are, and have continued to assist in many ways in the development of the present dictionary. Their names will be mentioned again below. I wish to express here the deep debt of gratitude that I have to the various individuals and organizations without whose unstinting assistance this dictionary could never have been written. First and by far the greatest debt is to the people of Guinaang, Bontoc, who for years graciously tolerated the presence of a foreigner in their midst, welcomed him and his family into their homes, patiently helped him learn the intricacies of their language, proudly revealed to him the jewels of their culture and extended to him a level of hospitality and friendship that can rarely be matched. I am especially thankful to the following people, whose contribution to this work either directly or indirectly has been outstanding. and the scores of others, too many to name, whose contributions were without a doubt just as real as the individuals named above. The National Science Foundation for the generous aid provided by grant GS3164. *Edgar C. Knowlton, Jr., Professor of European Languages of the University of Hawaii, who assisted in identification of Spanish loan words. Robert Hsu and Ann Peters, Professors of Linguistics of the University of Hawai'i, who planned and executed the computer programs used during the preparation of the dictionary. Thanks must also go to the many students and others who helped in the seemingly endless tasks or keypunching, typing and proofreading. Without their help this work would still be incomplete. Many of the young Guinaang people who were my constant companions during my years of residence in their home village in the 1960's are now parents and grandparents, and active leaders in the community. During my annual visits to them in recent years they have continued to shower me with their hospitality and to treat me as an honored friend. There are too many to be named, but I would be ungrateful to fail to mention at least some of the families whose assistance in one way or another has directly resulted in improvements in the present dictionary from the earlier one. Elizabeth Changayo Anongos, who with her late husband, Stanley, were my main language consultants in 1970 during the preparation of the first dictionary, has continued to assist with this work and to offer the hospitality of their home whenever possible. Charles Parongok Camfili, who met me on my first visit to Guinaang in 1959, has remained a loyal friend and language consultant, and is the voice heard on all the sound files associated with words and examples in this dictionary. His daughter, Phyllene, is shown with me on my front page photograph. Luke Pakoran Catay, his wife Isso, and their children, the Rev. Norman Catay, Steve, Anseidi, Luke, Jr., Antonette, and Susan have incorporated me into their family, and actively assist in whatever way they can to make my visits to their home comfortable and productive. My appreciation for their help is immeasurable. David Nathan, Australian Institute of Aboriginal and Torres Strait Islander Studies, Canberra, Australia, who preceded me as a Visiting Researcher at the Information Resource Center, for outlining for me various options available for web publication of a dictionary, and for encouraging me to move my data into a relational database. Ritsuko Kikusawa for hosting me at the Institute, coordinating the project, introducing me to the software that was needed, helping me move my data into FileMaker Pro, setting up layouts for each of the files, writing scripts for the sorting handles, and for actively seeking solutions to each problem area as it arose. Her unfailing good humor and patience with a neophyte to web publishing made my year in Japan a memorable experience. Koji Shibano for his friendship and sincere interest in my project, his expert advice which enabled intractable problems to be solved, and his readiness to find programmers who could bring the work to fruition. I am also grateful to the following student assistants and other personnel who actively participated in the project and without whose help the work would never have been completed. Yoko Kasai, Yuki Inaida, Tomoko Endo, and Katsuhiko Shiota for the primary processing of the sound and image data. Soichi Ogishima for writing the programs that convert phonemic forms into local, phonetic, and generic orthographies. Yoichiro Tanaka for writing the Java applets for the software keyboards. Rintaro Tanaka for design and layout programming. Yu Iimuro for the design of the Search and Result pages, for writing the programs that enable web searching of the FileMaker Pro files, for assembling the various programs and making sure they are correctly integrated. His technical expertise proved to be really invaluable. Finally, I wish to thank my home Institutions, the Social Science Research Institute, and the Department of Linguistics of the University of Hawai'i at Manoa, Honolulu, Hawai'i, for granting me the necessary leave from my duties there in order for me to do this project.